We at Whitney Brothers Heating & Air Conditioning take pride in delivering clean, quality home heating oil at an affordable price. Heating your home with oil not only provides safe, comfortable heating each winter, but it also allows you to choose your heating company based on your home heating needs. Our automatic fuel delivery option makes managing your fuel deliveries easier than ever. Instead of being so concerned about when you’ll need your next oil delivery and frequently monitoring your fuel tank, our computerized system tracks the weather and your fuel consumption patterns to generate your delivery automatically. This can save you time and add convenience to your deliveries each heating season. There is no additional cost to become an automatic delivery customer. Call our office to learn more! 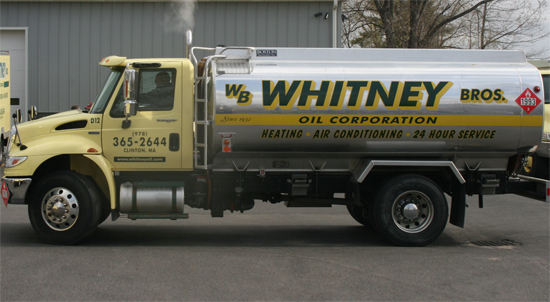 Whitney Brothers Heating & Air Conditioning also offers will call oil delivery. Will call oil delivery allows our customers to monitor and decide when to purchase fuel oil. This is helpful for customers that want to be in full control of when they have expenses for fuel oil. A simple phone call to our office is all it takes to schedule a delivery.